You are here : SunHealth AZ Blog Too much Sugar? How about Stevia ? Too much Sugar? How about Stevia ? Stevia: Getting fat and unhealthy with Sugar? Are we eating too much Sugar? How about trying Stevia? It seems so. It seems like every packaged, bagged, caned or processed “food” has sugar added to it. Who would have known that there is sugar in Ketchup? For every teaspoon of Katchup there is 3.7 GRAMS of SUGAR….. that means that about a fourth of your ketchup bottle is SUGAR! A fourth of the bottle! 3.7 Grams of sugar is the same amount of sugar found in ONE Chocolate Chip cookie ….. No wonder I used to love ketchup. I loved ketchup so much that I could not get enough of it on my french fries (back in the day). We used to have it in the house all the time, up until the day I just got up from the dinner table and just threw it in to the trash can. That did not go over well …. I just realized that I was addicted to the Sugar in the ketchup. I even used to put ketchup on my eggs and potatoes when we would go out for breakfast. What about Pizza? Is there sugar in Pizza ? Are we eating to much Sugar ? A slice of the average frozen cheese pizza contains about 5 grams of sugar. An average piece of pizza with meat, such as pepperoni or sausage, has closer to 6 grams. What about those “Health” Bars you see everywhere? How much “hidden” sugar is in them? I have seen” Health” bars in the supper market that have anywhere from 10 to even 19 grams of Sugar in them….. that’s almost 30-40% of the weight of the “Health” bar!!! How about a can of soda? In a can of soda you can have around 33 grams of sugar! One Can! How about a 21oz medium soda from your nearby fast food restaurant? In your medium soda you will find 44 grams of sugar! That’s one drink! At one meal! What if you get a refill? Or even worse, what if your child gets a refill!?!?! Sugar is not only bad for your weight, but it detrimental to your over all health. Too much sugar also raises your triglycerides, which means it’s harder for your body to get rid of excess fat in your arteries. 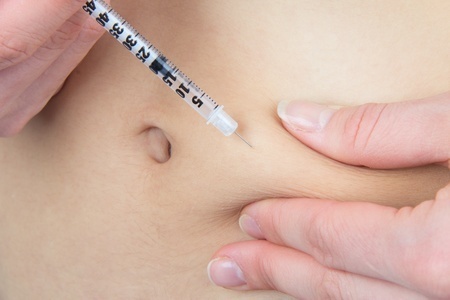 Elevated triglycerides puts you at a higher risk for heart disease. Sugar contributes to tooth decay, too. According to MayoClinic.com, women shouldn’t have more than 6 teaspoons, or 24 grams, of sugar per day. Men should limit themselves to 9 teaspoons, or 36 grams, each day. New federal dietary guidelines are now urging Americans to drastically cut back on sugar. The advice to cut back on sugar echoes similar advice from the World Health Organization and other groups, which has cited evidence that lowering the amount of added sugar could reduce the risk of obesity, heart disease, Type 2 diabetes and some types of cancer. I have found that sugar is very addictive. It is hard to stop. take ice cream for example… so hard to just have a small cone….Some say sugar is addictive like a drug. What can we do to “wean” ourselves off of this addiction of sugar, get healthy and lose the unwanted weight we all long for? I have found that small steps are always a great way to start. It takes sometime and planing, but it is possible and achievable. The first thing I suggest is to start looking at the ingredients in the foods that you purchase at the store. This will help you cut down on unwanted hidden sugar and and assist you with making better choices with shopping for you and your family. I have also found that when replacing bad foods that with great tasting fruit, I get the sweet taste without the bad sugars. I love that fruit has the fiber, natural vitamins, minerals and the sugar that my body is craving. Sunrider Whole Foods and Drinks, Regenerate your body! The first thing I suggest is to stock up on some of your favorite fruit. Whatever fruit you like. I personal love watermelon, bananas, oranges, dates, apples, mangos, grapes. 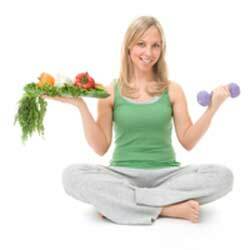 Traditionally, a diet high in fruits and vegetables has been shown to help prevent weight gain. Now you feel great because you are still getting that sweet taste you want and you are nourishing your body with wonderful healthy foods. So go get some fruit. What if you want something sweet in your tea or coffee or you want to sweeten your baking ?What else can we do to get that great tasting sweet flavor without the bad sugar. I have found that the Sunrider Sunnydew is a wonderful natural sweetener without the bad issues that sugar has. The Sunrider Sunnydew’s is a Zero-Calorie Flavor Booster.The main food ingredient in the Sunrider Sunnydew is Stevia. “Many companies are now marketing stevia products, but ours is very different. We use special extraction and concentration process to enhance it’s benefits. You can also taste the difference-our SunnyDew and Sunectar have a unique, delicious flavor with no aftertaste” Dr. Tei-Fu Chen, Founder and Chairman of the Board of Sunrider International. We Love SunnyDew Stevia!! 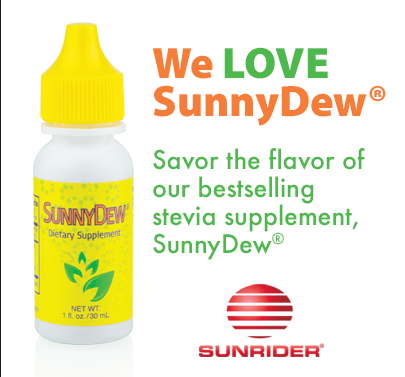 Savor the flavor of our bestselling Stevia Supplement, SunnyDew! SunnyDew is an all-natural, potent blend of stevia leaf extract and chrysanthemum flowers that can help maintain normal blood-sugar levels, and is an excellent supplement that can enhance any snap, meal or drink. Other brands commonly use a chemical reaction to process stevia, altering it’s natural structure, but Sunrider’s process is different. Sunrider’s unique purifying and concentration process preserves the natural structure found in the whole food form and creates a much better taste for you and your entire family to enjoy. Great tasting – Zero Calories ! Stevia is a naturally sweet herb indigenous to South America and has been used by its inhabitants and Asians for centuries as a dietary supplement. Containing zero calories, the natural extract from the leaves of the stevia plant makes an excellent flavor enhancer. This herb is also used to hep maintain normal blood-sugar levels and is a wonderful supplement to foods and beverages. Long before recent stevia buzz, Dr. Chen was hard at work manufacturing and marketing products that contained stevia. In 1982, Sunrider was one of the first companies to introduce stevia to the market with the launch of TruSweet. (later replaced by Sunectar), and in 1995 Sunrider successfully petitioned the FDA to lift the import alert of stevia leaves, clearing the way for the use of stevia as a dietary supplement in the United States. Under Dr. Chen, Sunrider has been an early innovator and a pioneer in the use of stevia in the Sunrider products for over 30 years. Energy Drinks – Too Drink or NOT to Drink?